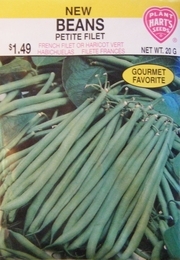 A pencil thin gourmet green bean preferred by many cooks for their superior flavor. Deep green and tender 5-6 inch pods on sturdy bush type plants. These beans will germinate best and be very prolific if you are patient and wait until the soil is warm before planting. Pick pods when young and often to encourage continued bean production. The flowers are also edible and can be added fresh to salads for a bean like flavor and gourmet presentation.